Typically, when a user becomes infected by a crypto-ransomware, the infection targets and encrypts the files on the victim's hard drives. This leaves the operating system working properly, but with the user unable to open the encrypted documents. The Petya Ransomware takes it to the next level by encrypting portions of the hard drive itself that make it so you are unable to access anything on the drive, including Windows. 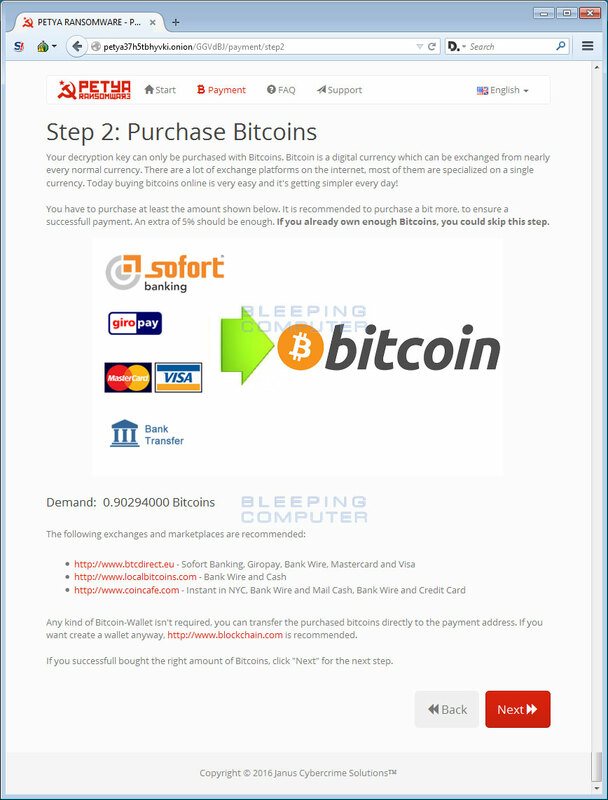 At the time of this writing, the ransom payments are at ~.9 bitcoins and there is no way to decrypt your drive for free. 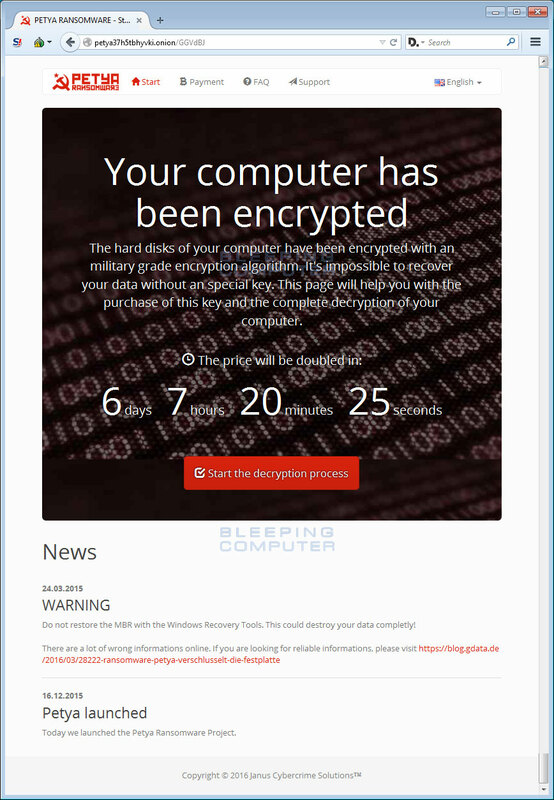 This ransomware is currently being distributed via emails that are targeting the human resources departments of German companies. These emails contain dropbox links to supposed applications that download a file that when executed will install the Petya Ransomware on the computer. An example filename for the installer is Bewerbungsmappe-gepackt.exe. 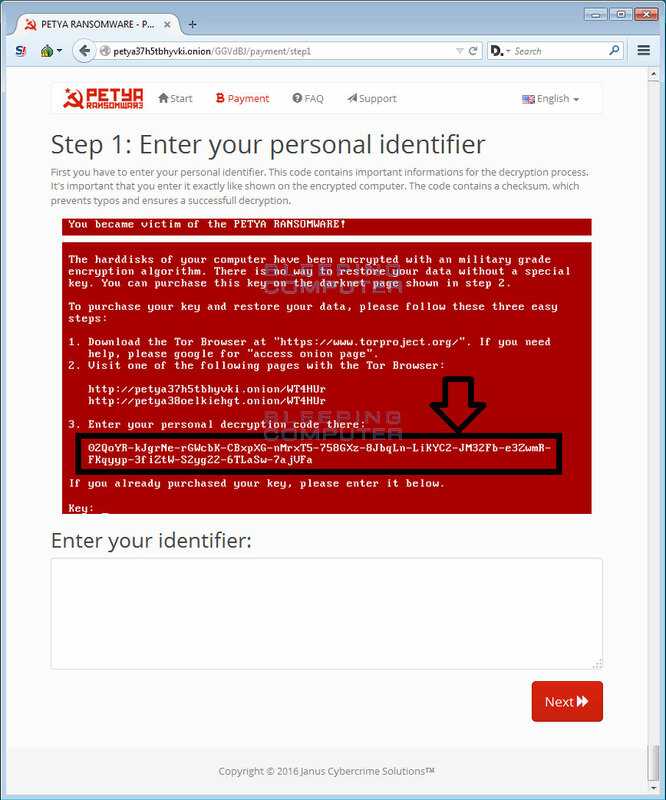 It is important to note that there is a lot of bad information on the web about how how to fix your computer when it has been encrypted by Petya. Many of these sites state that you can use the FixMBR command or repair your MBR to remove the infection. Though this will indeed remove the lock screen, it will not decrypt your MFT and thus your files and Windows will still be inaccessible. 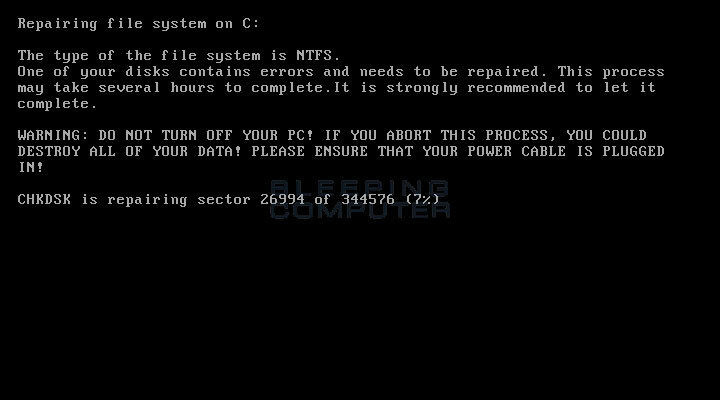 Only repair the MBR if you do not care about any lost data and want to reinstall Windows. Back in January, there was another short-lived ransomware that was performing the same behavior, but was not as advanced. At that time, though, a sample was not able to be retrieved. It is unsure if Petya is a redesigned version of the previous one shown below. When first installed, the Petya Ransomware will replace the boot drive's existing Master Boot Record, or MBR, with a malicious loader. The MBR is information placed at the very beginning on a hard drive that tells the computer how it should boot the operating system. It will then cause Windows to reboot in order to execute the new malicious ransomware loader, which will display a screen pretending to be CHKDSK. During this fake CHKDSK stage, Petya will encrypt the Master File Table on the drive. Once the MFT is corrupted, or encrypted in this case, the computer does not know where files are located, or if they even exist, and thus they are not accessible. Once the fake CHKDSK is completed, you will be presented with a lock screen that displays instructions on connecting to a TOR site and a unique ID you must use on the site to make the ransom payment. 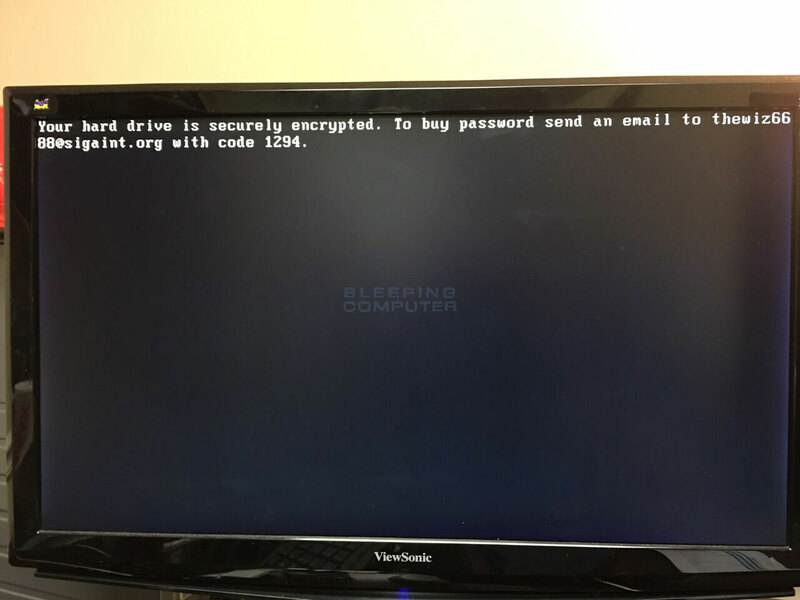 Once a ransom payment has been made, you will receive a password that you can enter into this screen to decrypt your computer. How the Petya Ransomware encrypts your drive is illustrated in the video below. When a victim visits the site they will be presented with a CAPTCHA page. Once a captcha is entered they will be shown the first page of the decryption site, which provides information on what has happened to the computer. 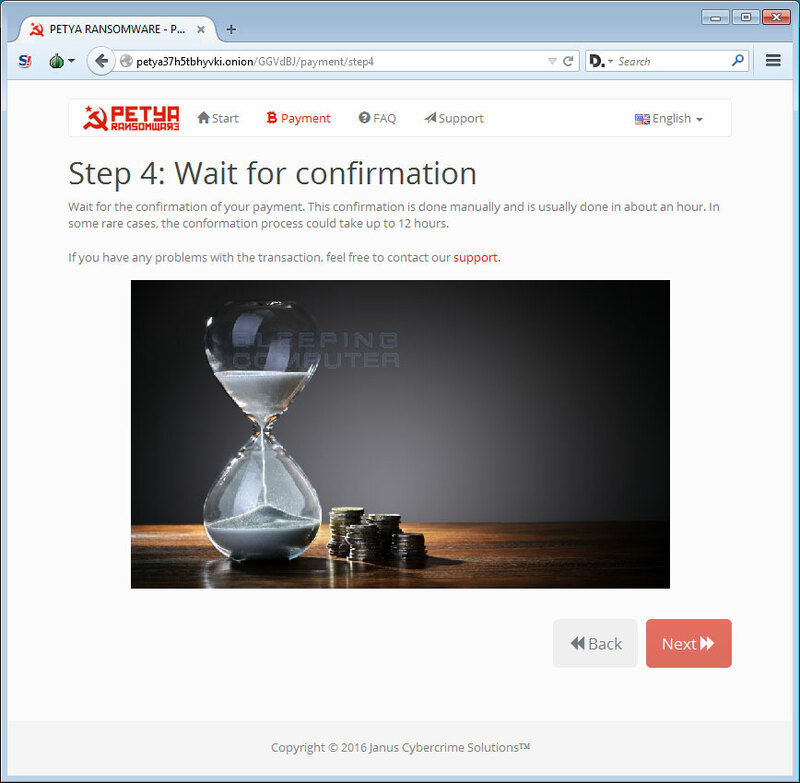 If a user clicks on the Start the decryption process they will be walked through a 5 step process where they learn how to make a payment and eventually retrieve a password. These steps are displayed below. 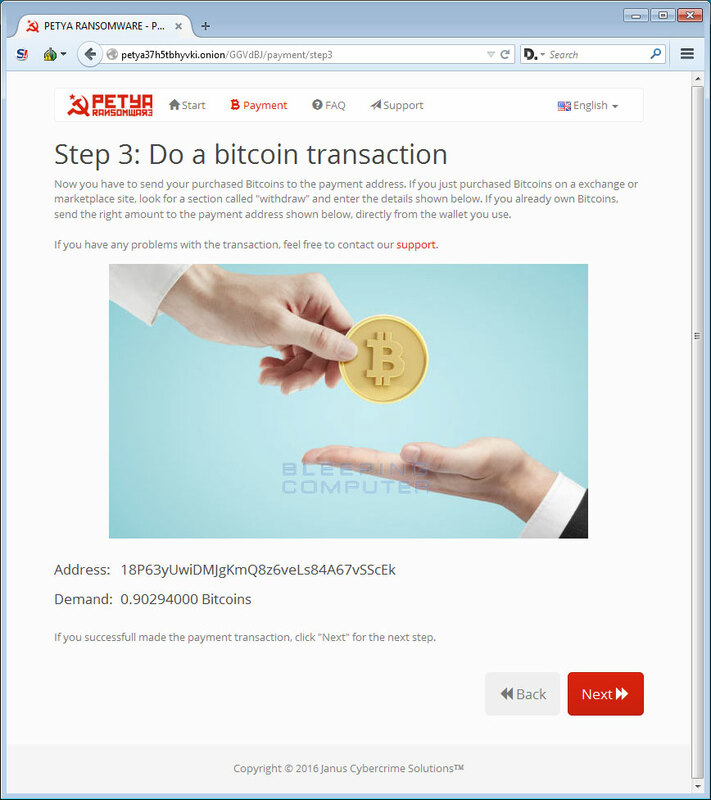 The fifth and final step becomes available when a ransom payment is sent to the associated address. It is assumed that the fifth step will display a page that contains the password you must enter into the lock screen on the victim's computer. Once a password is entered, the ransomware will decrypt the MFT and restore the original MBR. This will then allow you to boot back into Windows and access your files again.